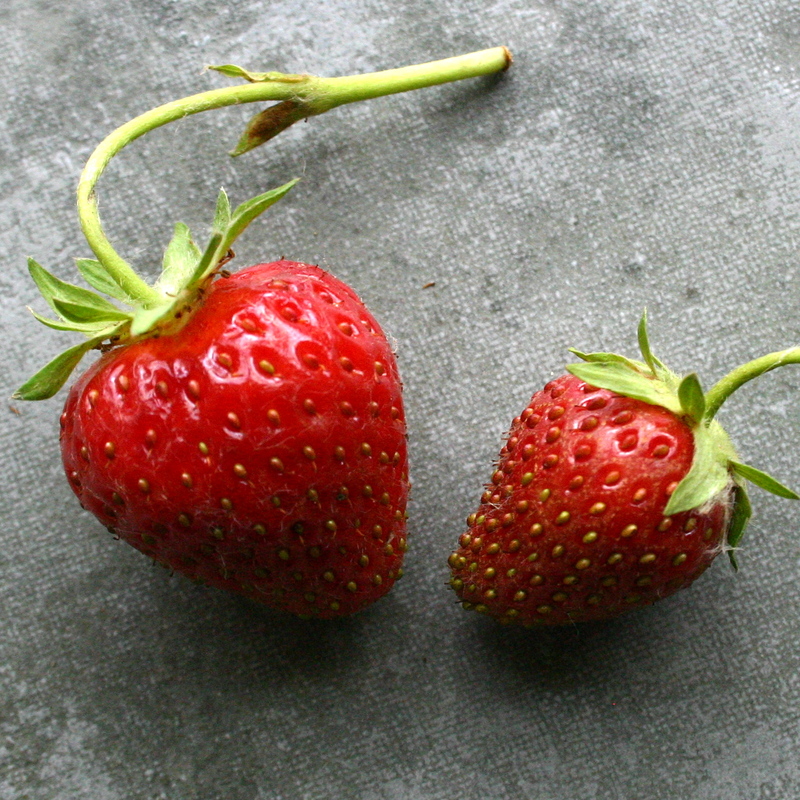 In Japan, my grandma had strawberry spoons – spoons with a flattened back. My sister, cousins and I would gather at my grandma’s house in the summer. Each of us would get a bowl of strawberries and milk, then a little sugar to sprinkle on top. We’d smash them until the milk turned pink. The mash was sooo sweet and delicious. There is something about smashing it that makes it more decadent…perhaps it’s because we had the mashed, creamy strawberries course, then the rich milkshake to follow it. Now, with my son, we mash strawberries in yogurt without the sugar. We call it “smash smash strawberries.” Recently, we’ve tried it with raw cow’s milk from Cozy Valley Farm and local strawberries from Boistfort Valley Farm. Yum! 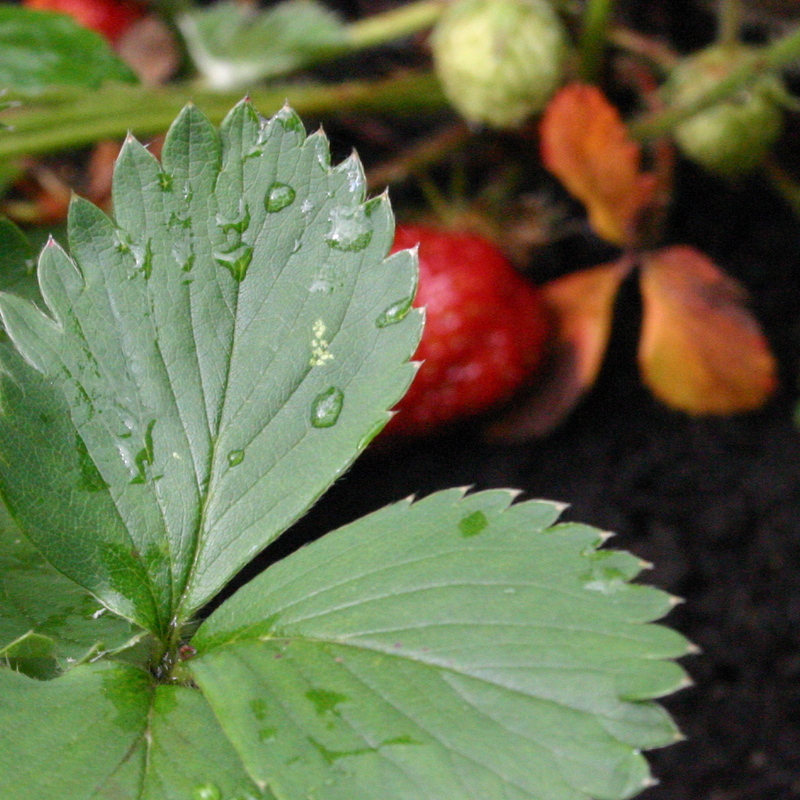 Before we dive into the recipes, a word about organic berries. Why don’t we buy conventional strawberries? 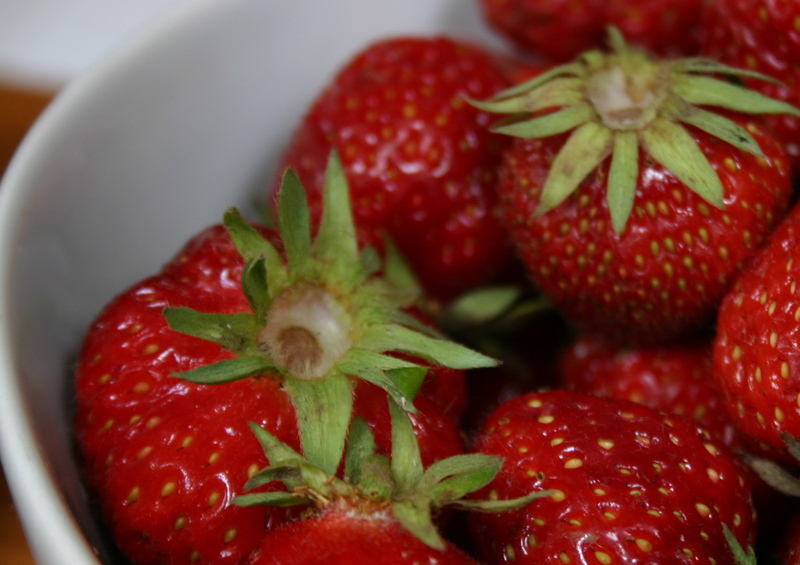 Because strawberries are on the Environmental Working Group’s “Dirty Dozen” list along with celery, peaches, potatoes, apples, bell peppers, spinach, kale/collards, lettuce, domestic blueberries and imported grapes and nectarines. These produce items have the most pesticide residues. So it’s important to use organic ones. 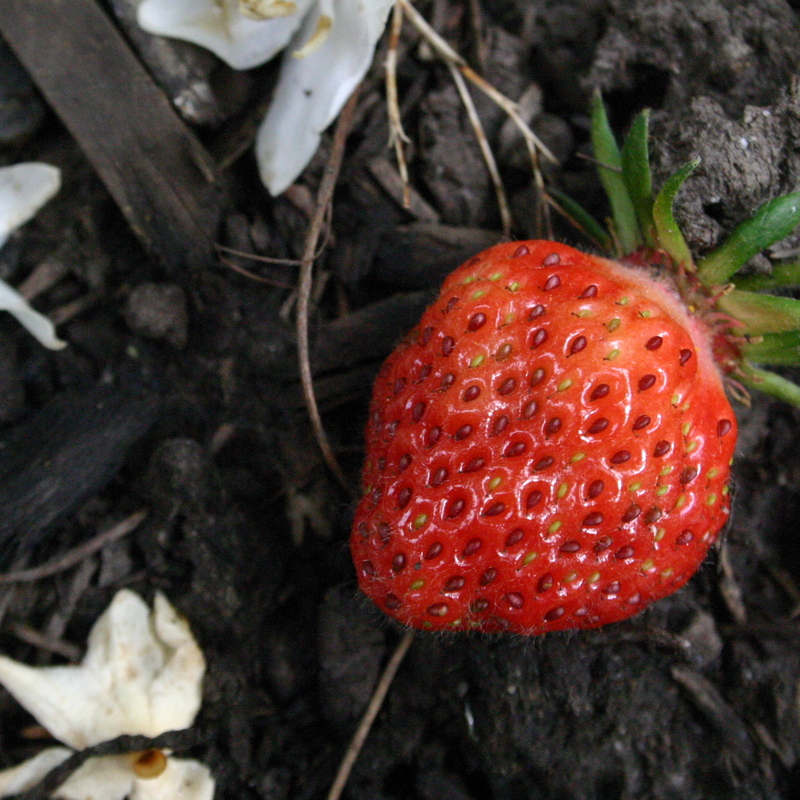 When I was working at a fine vegetarian restaurant, we would take sun-ripened strawberries and macerate them. The juices of the berries, honey and lemon marrying…accentuating their sweetness even more. It was the combination of lemon zest and sugar that made them sing in your mouth. Slice strawberries and place in a large bowl. Toss with the lemon zest, juice, and honey. Slice the vanilla bean lengthwise and scrape out the seeds with the side of a knife. Toss the beans and pod with the strawberries. Let sit. Enjoy on top of plain yogurt, whipped cream, scones, ice cream, as a filling for buckwheat crepes or use in the recipe below. Whisk the egg yolks, honey and zest in a medium sized pot until the texture becomes light. Whisk in the lemon juice. Stir constantly with a wooden spoon until it starts to thicken. Add the butter chunks and stir until combined. Pour through a sieve into a flat container to cool. Cover and refrigerate. Drain the nuts well. Place the ingredients in a food processor. The mixture should be moist and clumpy. Press into a standard 9.5 inch pie pan. Bake until fragrant, about 15 minutes. Cool. * I like to soak my nuts because it allows my body to digest them better. Place lemon curd into the cooled crust and smooth the surface. (You may need to whisk it just before filling the crust if the curd is completely cooled to make sure it smooths nicely.) Place macerated or fresh strawberries on top. I like to line up the berries and fan them in a circular pattern. This entry was posted in Recipes, Summer Fruits and tagged Honey, Local, Organic, Strawberry, Yogurt. Bookmark the permalink. Jenni, this looks AMAZING! And I love your writing! I wonder how the pie would be with raspberries (?) We have tons of them in the yard, but no strawberries planted yet. Looking forward to seeing you soon!! I can’t take much credit for this week – the recipes are all Chie’s (and she is an amazing chef). If you try the pie with raspberries, write back and let us know! Thanks for visiting! Hello Mary Janelle, It’s such an amazing time for fresh food. Let me know how things turned out! Thanks for checking us out. Can’t wait to try the lemon curd pie! YUM! And thanks for visiting, Jen. Let us know how it turns out!